The Egyptian hieroglyph for city was a cross (see fig. 508), which gives an indication of city quarters in general. It can be assumed that the ‘open’ four-division (of the cross) was the basic point of reference with regards to a city (associated with a Second Quadrant setting). However, the Egyptians did not seem to be concerned with the actual space within the individual areas. The need for security sometimes urged a town to be ‘closed’ by a wall – and enter the sphere of the square/rectangular cities (in a Third Quadrant setting). The grid-type was only used under special circumstances when social and/or political motives promoted a consciously planned urbanization (in a Fourth Quadrant setting). The workers’ quarters near the pyramids of Gizeh (pyramid of Menkaure) can be regarded as one of the first ‘rectangular urbanization’ in Egypt, dating from the Old Kingdom (2686 – 2160 BC). Much younger – from the New Kingdom (16th to the 11th century BC) – are the quarters (town) of Deir El-Medina near Thebes, where skilled craftsmen (and their families) lived. They cut out the tombs in the Valley of the Kings (and Queens) and constructed the temples in nearby Luxor and Karnak. The city of Hotepsenusret (or Kahun) was founded by Senusret II (Khakheperre; or in Greek: Sesostris II). The rectangular, grid-type city measured 350 by 400 meters (fig. 582). Sesostris II was the fourth pharaoh of the Twelfth Dynasty (of the Middle Kingdom). He ruled from 1897 – 1878 BC. There were no wars or military campaigns during his reign, and he directed his efforts to economic projects like the cultivation of the Fayoum (oasis). The irrigation scheme included the building of dykes and the digging of canals to connect the Fayoum with the waterway of Bahr Yusef. Fig. 582 – The city of Hotepsenusret (Kahun) was founded by pharaoh Senusret II (Twelfth Dynasty; Middle Kingdom) in the Fayoum and laid out in approximately straight lines. The main street was nine meters wide, while the streets in the residential district measured about one and a half meter. The workers’ quarters were situated in the western part of the city, with the cul-de-sac streets. Traces of a temple are found in the southwestern corner. A wall, running north-south divided the workers’ area from more spacious living quarters of the higher classes, while the main palace was situated in the southeastern corner. The (Egyptian) Labyrinth, although not a city, had a strict orthogonal layout (see fig. 47). The complex was also situated in the Fayoum and built by Amenemhet III (1817 – 1772 BC; Middle Kingdom) as part of the pyramid of Hawara. There were, according to Herodotus (in the fifth century BC), three thousand rooms. He described that ‘the roof of every chamber, courtyard and gallery is, like the walls, of stone. The walls are covered with carved figures, and each court is exquisitely built of white marble and surrounded by a colonnade’. 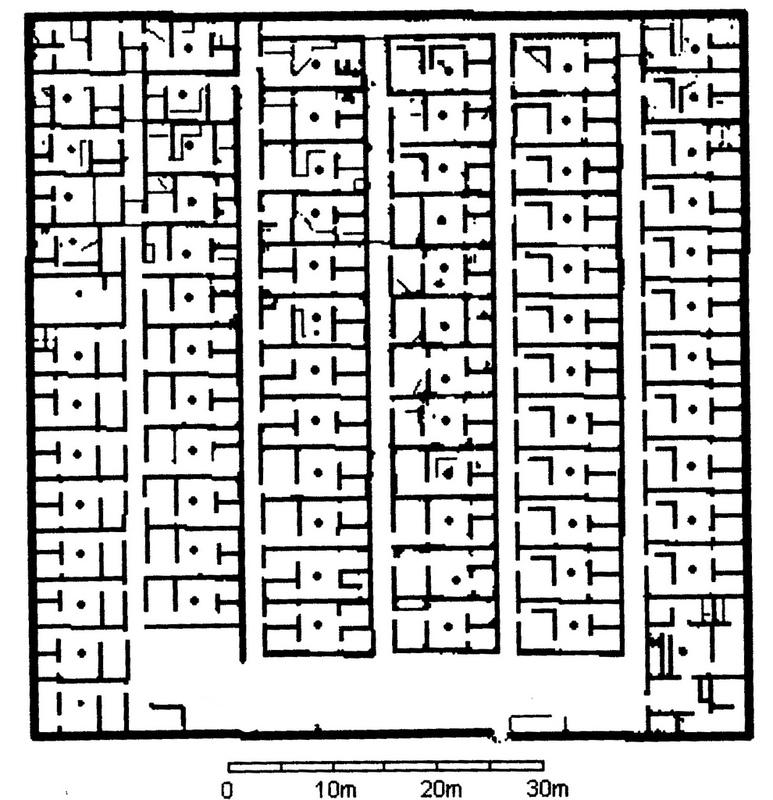 Another example of an Egyptian grid-type of ‘city’ was the workers’ village in the capital of Akhetaten (The Horizon of the Aten; also known as Amarna), created in the New Kingdom by the heretic pharaoh Akhenaten (fig. 583). The pattern resembles that of the Labyrinth and is more grid-like than the plans of Kahun and Deir El-Medina. Fig. 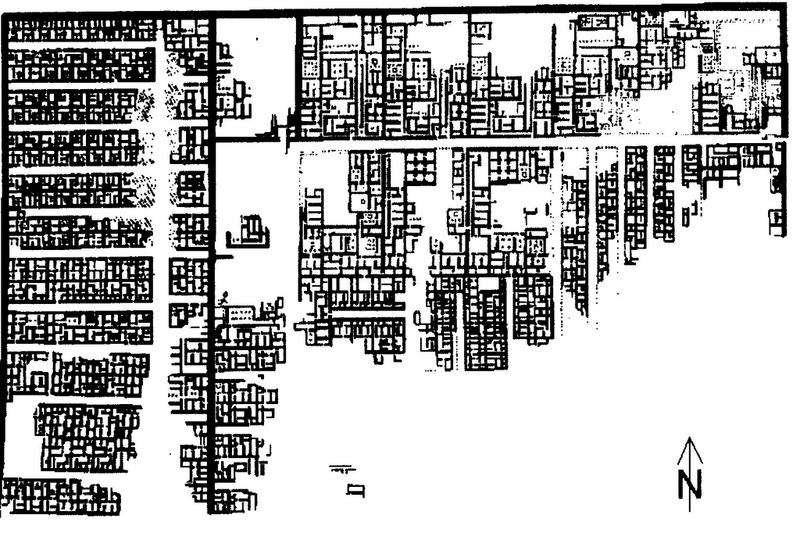 583 – The workers’ settlement in the city of Akhetaten (Amarna) had a grid pattern, which differed widely from the spacious and ‘empty’ design of the central city of Amarna itself. The city was created by pharaoh Achnaten in the New Kingdom, who tried to introduce a monotheistic worship of Aten. The period of his reign is called the Amarna period (Late Eighteenth Dynasty, c. 1353 BC) and marks a particular psychological crisis within the Egyptian cultural history. It is an interesting (quadralectic) exercise to position the various traces of orthogonal and grid quarters (cities) on the CF-graph of the Egyptian cultural history (as earlier given in fig. 58) (fig. 584). This universal graph gives the relation between an observer (the writer) and – in this case – the historic existence of Egypt’s civilization. The (CF) values are an expression of the distance between these two entities in terms of visibility (and associated understanding). Higher values indicate an alienation (contrast), while lower values are a measure of the approach (congruence). Fig. 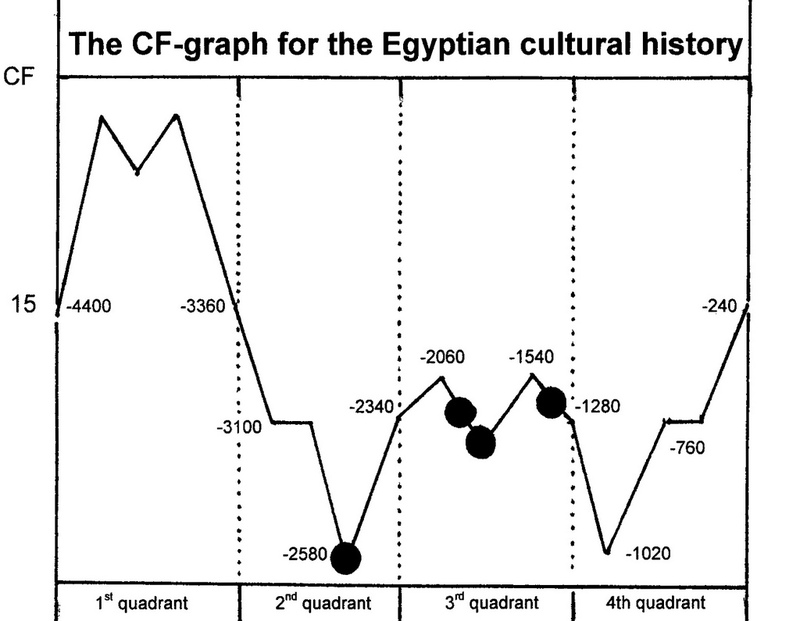 584 – This CF-graph of the Egyptian cultural period gives the position of some orthogonal/grid towns in Egypt’s classical history. One of the conclusions can be, that this type of city plan is clustered around highlights in the architectonic history of Egypt. The first marker point is situated at the building of the great pyramids in Gizeh – in a relative short period of less than hundred years. This gigantic task must have been a well-organized exercise including the housing of its workers. The low CF-values (CF = 6) in the Second Quadrant are known on the CF-graph as the First Major Approach (FMA). The second marker point is in the Middle Kingdom with the city of Kahun and the regular pattern of the original Labyrinth (both in the Fayoum) as points of attention. They are situated on the CF-graph around the Pivotal Point (PP; CF = 10), the middle of the Third Quadrant. The third marker is in the New Kingdom, with Deir El Medina and Amarna’s workers village as representatives of Egyptian urban grid developments. The positions on the CF-graph point to extensive building activities under a directive government and the occurrence of grid-type of living quarters. Further comparisons with other cultural units might reveal a degree of analogy in this matter and can lead to a more general characterization of these areas on the CF-graph.